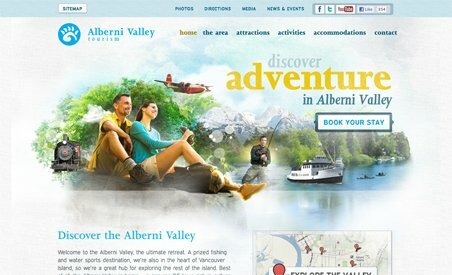 Whether you're interested in camping, hiking, fishing or simply spending time outdoors, a visit to the Alberni Valley should not be missed. The area is located on the central west coast of spectacular Vancouver Island, British Columbia and is home to mountains, lakes, beaches, waterfalls and rainforests. Outdoor enthusiasts will love the first-class mountain biking, hiking, rock climbing, kayaking, horseback riding and canoeing that the area offers. Whether you're interested in camping, hiking, fishing or simply spending time outdoors, a visit to the Alberni Valley should not be missed. The area is located on the central west coast of spectacular Vancouver Island, British Columbia and is home to mountains, lakes, beaches, waterfalls and rainforests. Outdoor enthusiasts will love the first-class mountain biking, hiking, rock climbing, kayaking, horseback riding and canoeing that the area offers. The Alberni Valley is a spectacular outdoor playground, but it’s also family-friendly, with hiking trails suitable for all ages, as well as many museums, historic attractions and cultural activities. Vacationing in the Alberni Valley is an exciting, unique experience.